We provide a full service which includes making flight reservations on your behalf. If you would like us to assist you with your flight reservation please add a note to the special requests section on our online booking form. Upon receiving your booking we will contact you to discuss the best possible flight arrangements for you. Please note, flights are an additional cost to the package price advertised on our website. After breakfast, you will visit the Church of the Nativity, marking the birthplace of Christ. Visit Saint Catherine’s Church and Saint Jerome’s Cave where the bible was translated. Continue to Milk Grotto and then visit the Shepherd’s Field. Visit Cremisan Valley, one of the last green areas in the Bethlehem district, with vast stretches of agricultural lands and recreational grounds. The Salesian Sisters Convent and School, the Salesian Monastery and Cremisan Cellars are located in the valley. Dinner and overnight. After breakfast, journey to the Mount of Olives and visit Pater Noster Church. Continue to see the panoramic view of the old city of Jerusalem. Proceed to Dominus Flevit then walk the Palm Sunday route and descend to the Garden of Gethsemane where Jesus spent the last night before he was arrested. Visit the famous Church of All Nations before driving to the Biblical village of Ein Karem, birth place of John the Baptist. Visit Church of the Visitation that honours the visit paid by the Virgin Mary to Elizabeth. This is the site where tradition tells us that Mary recited her song of praise, the Magnificat, one of the most ancient hymns to Mary. Dinner and overnight. After breakfast, you will visit Mount Zion and the Church of the Dormition, the place where Virgin Mary fell asleep. Visit Cenacle, also known as the “Upper Room”, the site of The Last Supper. Continue to Saint Peter Gallicantu, which symbolizes Peter’s denial of Jesus. Drive to Jericho, one of the earliest continuous settlements in the world, dating perhaps from about 9000 BCE. Visit the spot where the Jordan river flows from the Sea of Galilee with time to reflect on the Baptism at the Jordan River. View Mt. Temptation, where Jesus fasted and was tempted by Satan, and see an example of Zacchaeus’ Sycamore Tree and Elijah’s Spring. At some point today you will have the opportunity to float in the Dead Sea. Dinner and overnight. This morning, after a very early breakfast, we start the Way of the Cross at the Antonia Fortress, where Jesus was condemned to death by Pontius Pilate. From there He was taken through the city to be crucified. The Stations of the Cross lead us to the Church of the Holy Sepulchre, visit Calvary and the empty Tomb. We then walk through the Old City to see the Western Wall (Wailing Wall), the Jewish Quarter, the Cardo and the Bazaars of the Moslem and Armenian Quarters. Dinner and overnight. After breakfast, we will drive to Jezreel Valley and visit Mount Tabor, traditional place of the transfiguration with time to reflect on Christ’s Humanity and Divinity. Continue to Nazareth, the home of Mary and Joseph, and visit the Basilica of the Annunciation and Saint Joseph’s Workshop. At Nazareth, , and visit the Byzantine Church of St. Joseph and Mary’s Well. Visit the convent of the Sisters of Nazareth where one of the nuns will give a tour of the fascinating excavations discovered there. In the afternoon visit Cana, where Jesus performed His first miracle at the request of His mother [John 2:1-11]. There visit the Franciscan chapel where those who wish to can perform the renewal of their wedding vows. Dinner and overnight at hotel. Dinner and overnight. The day starts at the Mount of Beatitudes, scene of Jesus’ great Sermon on the Mount. Then to Tabgha where Jesus fed the crowd of 5,000 and onto the site known as “Peter’s Primacy”. Here, after His resurrection, Jesus met with His disciples and told Peter to “feed my lambs; feed my sheep.” [John 21:9]. A short drive away is Capernaum, from where Jesus launched his Ministry; see the synagogue which dates to the time of Jesus and the church built over the site of Peter’s home.., then in the afternoon drive up to Caesarea Philippi, where Jesus told St. Peter “You are the Rock, and upon this rock I will build my Church.” Dinner and overnight. his morning after breakfast leave Mukhraka; the Monastery here commemorates Elijah confronting the prophets of Baal. Continue north to Haifa to visit Stella Maris, a Carmelite Monastery with the Madonna of Mt Carmel. After enjoying the view of the bay of Acco, head for Caesarea, which was once the ancient capital of the Roman province. Here you view the impressive archaeological remains of the Roman and Byzantine city that once dominated the region. It was at Caesarea that Peter came to understand that the Good News was not for Jews only, but for the whole world. Here he baptised the Roman Centurion, Cornelius, and his family. It was from Caesarea that Paul set sail for Rome, an event that eventually brought Christianity to the World. Dinner and overnight. Located in Jerusalem's beautiful American Colony neighbourhood and adjacent to Jerusalem's Old City and many of the city's holy sites. Olive Tree pride themselves on providing guests with first class accommodations in a warm and inviting atmosphere. 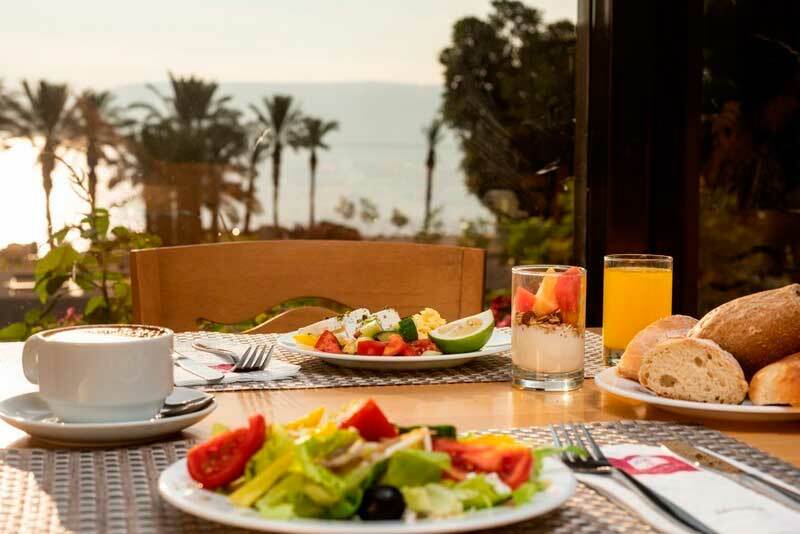 Overlooking the Sea of Galilee, Hotel Tiberias guarantees a relaxing stay in a fantastic location. The hotel provides 198 beautifully decorated room, all providing a panoramic views overlooking the Sea of Galilee. The Travel Trust Association is a travel trade association and exists in order to protect you, the customer, with 100% financial protection and has been doing so for over 20 years. This means that every penny you pay to Aglow Pilgrimages is protected by the Travel Trust Association.